This is the story of the chocolate workers’ strike, of 1890 which boosted the growth of women’s trade unionism in late Victorian England. In the aftermath of the Great Dock Strike of 1889, trade unionism flourished. Between 1888 and 1892 membership doubled from 750,000 to 1.5 million, and new groups of workers in previously unorganised trades and industries flooded into the movement. Among the many now forgotten strikes was that by East End chocolate makers in 1890. Though small in scale, and even at the time little noticed, it greatly encouraged those organising London’s tens of thousands of young women workers and produced yet another victory to celebrate. 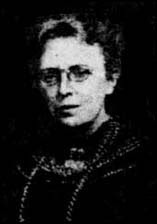 Writing in the Fortnightly Review of August 1890, Clementina Black (pictured), secretary of the Women’s Trade Union League, described how earlier attempts to organise both men and women in the confectionary trade had come to nothing. After a meeting for the young women working at Messrs Allen’s factory on 10 July, however, that changed. “Twelve girls came, and their dread of being followed, watched and subsequently discharged was pitiful,” wrote Black. The following day, the Women’s Trade Union League despatched Miss James, a full-time organiser and former confectionary worker, to distribute handbills at the factory in Emmott Street explaining the objects of the union. After the hubbub had subsided, six young women stayed behind to tell their story. It appeared that one had slipped and fallen at work. Hearing the commotion, the forewoman had issued her with a fine, which she refused to pay. The next morning, she was summoned to the office and told she must pay half a crown or be dismissed. At that, the other girls on the shop floor had stopped work and demanded her reinstatement. By 5pm, with no work done all day, Mr Allen himself came down to investigate. Unimpressed by what he discovered, he told them to “put on their hats and go home”. It was not a strike but a lock-out. Slowly, the full scale of the young women’s grievances emerged. They were forbidden to leave the factory in the dinner hour, forbidden to eat between eight and one on weekdays and between eight and two on Saturdays, and they were subject to “vexatious” fines and deductions from pay. Without the freedom to go outside at lunchtime, the girls spent all day from 8am to 7pm inside the factory. Clementina Black called in the legendary union organiser John Burns, and a meeting for all the factory girls employed by Messrs Allen’s was held at Mile End Liberal and Radical Club at which a committee was elected and a register drawn up. All those present also joined the union. The following Monday morning, John Burns and Miss James were at the factory gates before 8am, and a “business-like system of picketing” put in place. Just eight factory workers went in, though occasionally “a clerk would peep out” to see what was going on. Once a committee room had been set up in nearby Skidmore Street, a “polite note” was sent to Mr Allen asking for a meeting. Work then began to raise money to support the 80 or 90 young women who were out on strike, mainly by personal appeals to other trade unions since the Women’s Trade Union Association was forbidden to use its funds to support strikes. By the following day, money had begun to flow in, and the union organisers were able to issue tickets allowing the girls to get lunch and tea. Their cause was also boosted by support from the young women working at Messrs Allen’s Canal Road and Copperfield Road factories, who had wanted to join the strike. Not wanting to escalate the dispute, John Burns persuaded them to carry on working as normal, but promised that they should be called on to join the strike if necessary. Over the next few days, fundraising progressed remarkably well. Burns himself collected more than £50 in an hour at the London County Council offices; at the Woolwich Arsenal and in the docks, men lined up to donate coppers to the cause. An envelope postmarked House of Commons contained £5. By the Wednesday, Allen had replied to the letter sent by Burns, declining mediation and saying that he would rather deal with his workers directly. “On this, a deputation of girls was elected, and a letter sent in, asking Mr Allen to see them.” They were to demand reinstatement for the young woman whose dismissal had sparked the strike, a right to leave the factory at lunchtime, an end to fines, an end to the practice of suspending those who were absent for a further two or three days, and a promise of no punishment for those who had joined the union. Allen now decided that he would be well advised to meet John Burns before beginning talks with his workers, and a three-hour discussion took place which left no-one in doubt that the dispute would soon be over. A further series of meetings between Burns, Allen, Black and the striking factory workers themselves rapidly reached a satisfactory conclusion. In due course, Allen agreed to all the demands except the abolition of fines for lateness, which he agreed to reduce and withdraw at the end of the year provided attendance did not suffer as a result. An agreement was finally signed on 22 July, and work at the chocolate factory resumed.